The Village Theatre in Palm Springs has the distinction of being one of the very few movie theatres in the United States not to be represented on the Cinema Treasures web site, and so we have one here. The theatre was yet another resort theatre developed and owned by Earl Stebe, who also owned the Palace Theatre down the street. Located to the side and behind the pharmacy at the corner of Andreas and Palm Canyon Drive, its street address was 207 North Palm Canyon Drive. 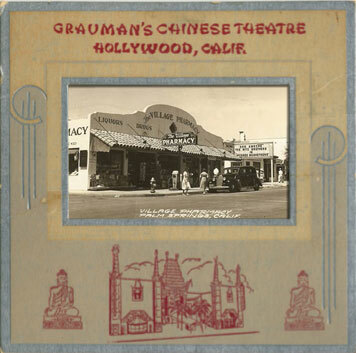 This picture, showing the Village Theatre playing the Don Ameche/Ritz Bros "The Three Musketeers" along with others, suggest that the theatre was in the same 20th Century-Fox / M-G-M / UA booking pattern as the Chinese was. The theatre must have closed during the 1970s sometime.